PEREGRINE Falcon closures have been lifted!!!! 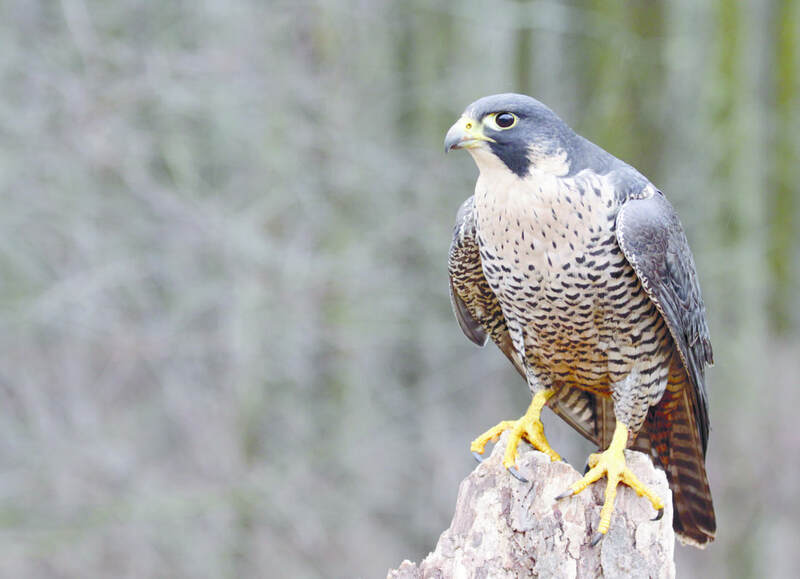 It has been confirmed that the Peregrine Falcon Closures that have been in place have been lifted by the Forest Service. I am awaiting more details from the Wildlife Biologist at the Douglas Ranger station but apparently after a review conducted by the Forest Service and Fish and Game they determined that peregrines were now nesting across multiple formations in the Cochise Stronghold and not just restricted to the Rockfellow and Dome park formations. 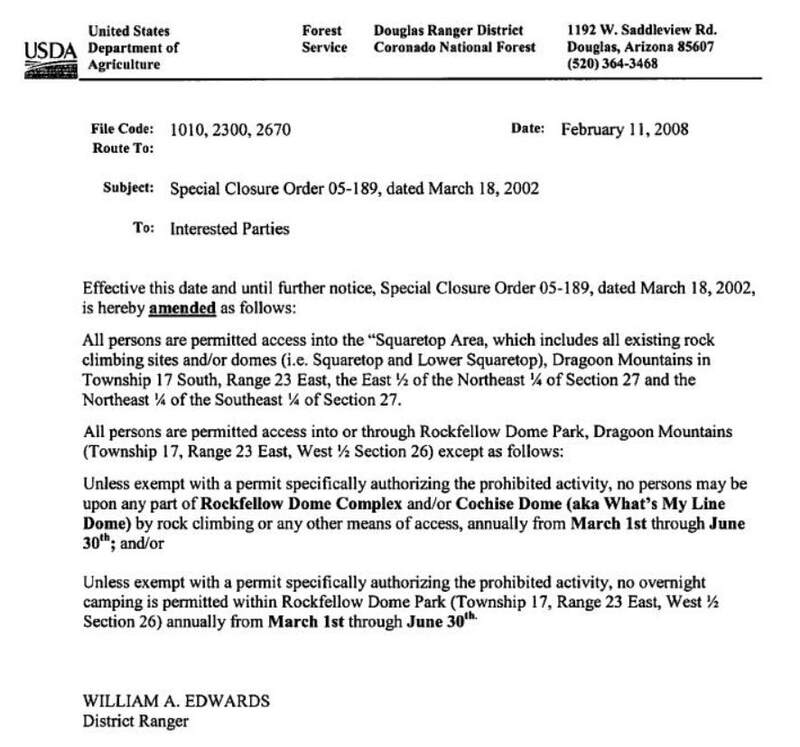 It was deemed to be unrealistic to close all of the area and that lifting the ban and instead encouraging the primary user group of climbers to self police and report nesting sites so climbers may avoid these is going to be attempted to allow recreation and falcon nesting to occur concurrently. As soon as I have the report that prompted this change I will post it here. "We ask that the public respect the nesting raptors and avoid areas where they are present. Should it become evident that this approach is not appropriate, we will revisit the need for a seasonal closure. Please call the Douglas office at 520-364-3468 or 520-388-8436 with questions." Territorial defense behavior fluctuates depending on the personality of the peregrine, the time of year, location of the interaction, status of the breeding cycle, and cause for defense. Young peregrines before they have the means of flight will flip on their backs and present their feet as a means of defense. This allows them to grab with their talons at whatever is trying to get at them. Adult peregrines use intimidation in flight as the main means of chasing perceived intruders away. This involves the falcon swooping at the intruder in an attempt to scare it away, which with people means flying over their heads. The majority of the time this does not involve any contact between bird and the person. The bird will keep this up until either the person goes away or the bird realizes that intruder is staying and stops the fly-overs. Occasionally after a few passes, the falcon will perch nearby and watch. During a fly-over, if the falcon actually makes contact, it does so in one of two manners. Some contacts are with the birds brushing the person with the tips of their wings. The other more common method involves bumping with the back of the feet. The equivalent would be to rap your knuckles against something. The falcons would not make any attempt to grab you with their talons. If it is at all possible, it is always best to stay away from nesting peregrines. In Chicago, the nesting season runs from March through June. Postponing work until after the nesting season, is the easiest solution to prevent interactions with the birds. Each nest site is unique in both building design and peregrine personalities. Defensive behavior of the falcons fluctuates depending on the personality of the peregrines, the time of year, location of the interaction, status of the breeding cycle, and cause for defense. In certain circumstances it may be possible to conduct work on a site even if the peregrines are nesting. There is no standard answer in how to deal with the peregrine falcons at a nest site, much of what can be done is dependent on the nature of the birds as well as the type of work. Of utmost concern is the protection of the falcons as well as the safety of personnel at the site. Adults return to nesting territories and begin courtship behavior. By the end of March, peregrines are laying eggs. The nest is a mere depression in the gravel. No outside nesting material is brought in. Normal clutch size is four eggs with one egg being laid every 36 hours. Peregrines will incubate for approximately 30 to 32 days after the last egg is laid. The male (tiercel) and the female (falcon) peregrine will take turns incubating the eggs. When disturbed at the nest at this time, if the female is on the eggs, she will remain so even if you are next to the nest. If the male is on the eggs, he will immediately take off and fly over the intruder while the female returns to the nest and eggs. The female may not immediately get back on the eggs but may perch nearby. If the disturbance is in another portion of the territory, the male may choose to defend it in a fly-over. Usually after a couple of passes, thewill perch where he can see the intruder and just watch. The eggs will hatch within 2-3 days. If after a week has passed since the last emergence of a chick, the unhatched eggs will be retrieved by a researcher. These are kept for analysis for such things as contaminant levels. From the time the first chick hatches until the last chick is about a week old, the adults display their most aggressive behavior. This coincides with when the chicks are the most vulnerable. The female now becomes the most aggressive of the pair. If the birds have the personality/behavior where they will actually make contact with an intruder during a fly-over, this is when it would happen and most likely by the female. When you have a fairly aggressive male, he will fly at the intruder in tandem with the female so the intruder is struck alternately by the female and then by the male. Generally fly-overs will continue until the intruder leaves. The chicks are banded when they are 21-24 days old. The chick’s body has grown to full size but it is still all covered in down. This is the time when it is safe to band because the leg will not grow any larger and the chick does not have any flight feathers. The adults may react at their peak aggression level if the chicks are in jeopardy. At approximately 42-45 days old, the chicks will take their first flight. This is generally a glide down to a lower spot where they will perch for a few hours while they try and orient themselves. Defense of the nesting area is now at the level of the beginning of the season. Though the aggressive nature of the adults has decreased, lack of disturbance to the nest is crucial as to prevent the young from premature fledging from the nest. 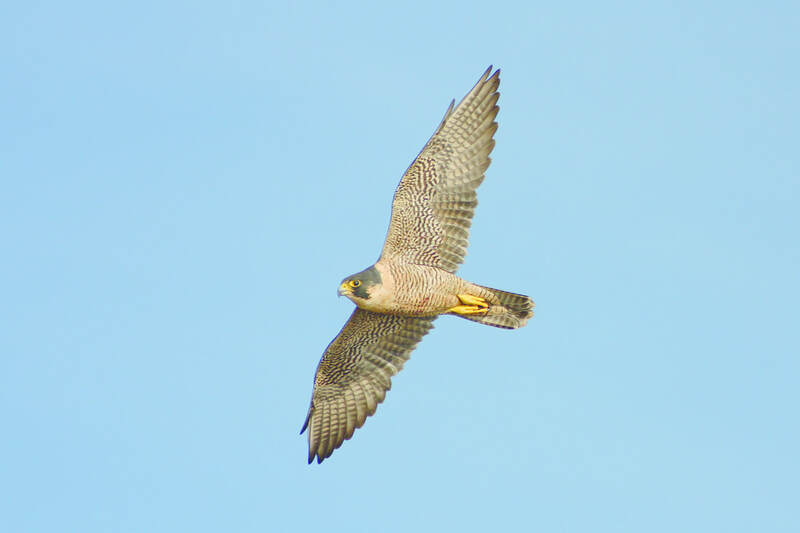 As the immature peregrines start flying more, they begin ranging further and further from their natal site. "The peregrine is without dispute the most nearly perfect flying machine in existence"
The peregrine falcon (Falco peregrinus) inhabits every continent but Antarctica. Peregrinus, Latin for wandering, reflects its capability of covering great distances. A flat powered flight of 60 mph enables the peregrine to maintain an extensive hunting area, up to 17 miles from a nest site. With strong talons, notched beak, and keen eyesight, the peregrine is a well-adapted hunter. Prey, most often birds, are caught on the wing. After spotting its prey, the peregrine dives at speeds of 150 to 200 mph. The peregrine grabs prey with both feet and breaks the neck. Its position at the top of its food chain makes the peregrine vulnerable to the threats of organo-chlorine pesticides (DDT). Widespread use of pesticides led to a major decline in peregrine numbers and, eventually, to their listing as an endangered species. Compounds accumulate in the bird as it ages and lead to difficulty in eeding. The most obvious threat is egg shell thinning that promotes breakage during the incubation period. Thinner shells also lose moisture faster and the chick dies as the egg dries out. This, combined with infertility and reported abnormal behavior during parenting, has led to many failed nesting attempts. Although DDT has been banned in the U.S. since the 1970s, it enters the chain when the peregrines’ prey eat grains or insects that have picked up DDT. If DDT runoff enters a river, such as the Rio Grande, it flows downstream. Many insects lay eggs and their larvae develop in the river. These tiny creatures pick up small traces of DDT and retain the poison within their body tissues. Upon hatching, many of these insects are consumed by the thousands by birds such as phoebes and swallows which get a strong dose of DDT in return. Phoebes and swallows are eaten by hungry peregrines, which now become contaminated. This DDT poisoning may begin thousands of miles away in the wintering grounds of swallows. Those swallows migrate to Big Bend and become food for peregrines which in turn pick up a long-distance dose of DDT. Pairs usually begin nesting by March. Nesting sites (eyries) are most often found on high cliff faces in the wild, but are also found on the ledges of high buildings in cities. The nest is made by clearing a small area in the stones or sand. The female lays three to four reddish brown eggs that are incubated 33 days by both parents. At six weeks, the young take their first flights and learn to catch prey in midair dropped to them by their parents. They remain with their parents until autumn. Most will not nest until they are two years old. 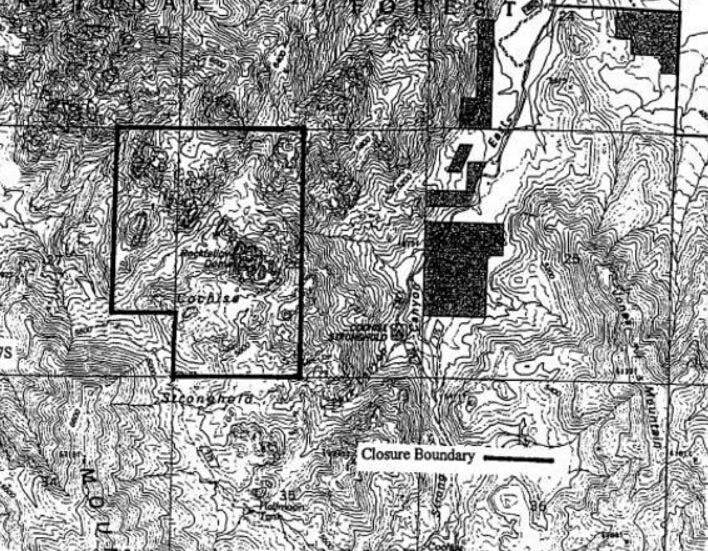 From ClimbAZ.com: Activity continued in 2013 to try and get the closures lifted on Mt. Lemmon and in the Stronghold. Unfortunately, it did not happen. Discussions were held Robert Mesta of the US Fish and Wildlife Service, Josh Taiz of the Coronado National Forest, and Tuk Jacobson of the Arizona Game and Fish. These discussions were held from December 2012 through March 2013. Scott McNamara and the Access Fund were continually updated on any activity regarding the Falcons. The primary driving force to re-open discussions is that the US Fish and Wildlife service has been lax in doing the required monitoring. They are chartered to monitor the birds every three years and provide reports to the public. They have not released any results since 2003. Discussions were held with Robert Mesta, trying to get the reports, but he was unable to get any new information since the 2003 report. The Arizona Game and Fish has not been lax however. They have monitoring reports available to the public from 2006, 2009, and 2012. The crux of the 2009 report can be summarized in this statement: "The 2009 PEFA nest site monitoring in Arizona resulted in occupancy, nest success and productivity levels that were lower than those in 2006, and well below target values for the Southwest Region." In a nutshell, based upon their sampling method (which they admit is debatable), they are concerned about the number of Peregrine Falcons and the fact that the population may be declining in Arizona. These are the Peregrine Falcon closures for 2013. Rockfellow Group Complex is closed between March 1st and June 30th. Cochise Dome (aka What's My Line Dome) and Dome Park is closed between March 1st and June 30th. The penalty for climbing in any of these areas during the closures is at most $500 or imprisonment for not more than six months, or both.